At least 18 people have been killed and scores more injured after severe storms lashed the southern US states. Fourteen people were killed in Georgia, and four people died in Mississippi as a result of the adverse weather. The deaths occurred as a direct result of severe weather according to State Emergency Management officials. Georgia's Gov. Nathan Deal has declared a state of emergency Sunday morning for seven counties in the state. "These storms have devastated communities and homes in SouthCentral Georgia, and the state is making all resources available to the impacted areas," Deal said in a statement. Southeastern parts of Georgia remain on high alert as severe weather warnings have been issued by the National Weather Service for the region along with neighbouring northern Florida. Catherine Howden of the Georgia Emergency Management Agency confirmed Sunday morning that the casualties took place in Cook, Brooks and Berrien counties, near the Georgia-Florida border. Howden said the deaths were related to severe weather but did not specify whether tornadoes were the specific cause. A tornado warning had been issued for parts of the state over night, with severe weather warnings remaining in place Sunday. Brooks County Sheriff’s Office confirmed that two people were killed early Sunday by a possible tornado, according to News4Jax. Meanwhile the Emergency Manager in Cook County confirmed that seven people were killed in the county, reported First Coast News. The National Weather Service have forecast an outbreak of tornadoes and severe thunderstorms over parts of north Florida and south Georgia Sunday and have asked people to review safety procedures for their area. It also expects the threat to extend southward into central Florida and northeastward into South Carolina this evening. 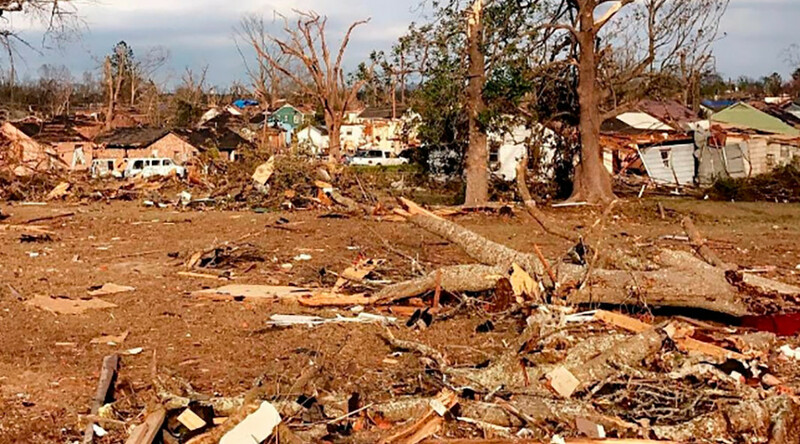 Four people were killed Saturday after a tornado ripped through the town of Hattiesburg in southern Mississippi leaving a trail of destruction in its wake. President Trump expressed his condolences to those affected by the severe storms and pledged federal assistance for Georgia, Florida and Alabama during a White House ceremony, Sunday. He said he had spoken with Georgia Governor Nathan Deal and planned to speak to Florida Governor Rick Scott about the storms. "The tornadoes were vicious and powerful and strong and they suffered greatly," he said. "So we'll be helping out."